Purchase this product now and earn 4,075 Reward Points! A unique formulation designed exclusively to support connective tissues associated with the spine. all necessary for the support and maintenance of connective tissue. high concentration in the tissue of the spine and intervertebral discs. ¤ Manganese is necessary for the activation of enzymes that are vital for the biosynthesis of glycosaminoglycans. 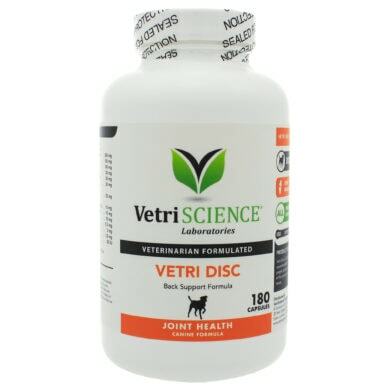 ¤ Provides Equisetum arvense a natural source of silicon which is necessary for the synthesis and integrity of connective tissue. ¤ Vitamin C (Calcium Ascorbate and Ascorbic Acid) supports collagen production and glycosaminoglycan metabolism. ¤ Calcium is essential for proper growth and maintenance of bone. ¤ Pyridoxine HCI (Vitamin B6) is necessary for the formation of certain proteins and aids in nerve function. ¤ Vitamin D aids in the absorption of Calcium from the intestinal tract and in the breakdown and assimilation of phosphorous. important role in neuromuscular contractions (relaxes the muscles). ¤ Zinc (Sulfate) is necessary for tissue respiration and is important in the healing process. ¤ Taurine is a sulfur containing amino acid involved in the synthesis of connective tissue. ¤ Serine is an amino acid which links the glycosaminoglycans structure to the protein portion of connective tissue. Under 15 lbs: 1 capsule daily. 16 – 35 lbs: 2 capsules daily. 36 – 80 lbs: 3 capsules daily. Over 80 lbs: 4 capsules daily.